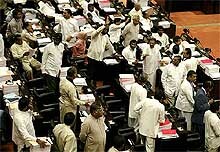 Sri Lanka's Parliament reopened today, ruling that President Chandrika Kumaratunga's two-week suspension of the Assembly was illegal and that it would disregard any future attempt to disrupt the legislature. 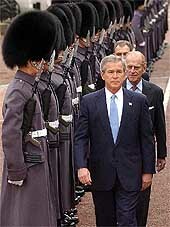 US President George W. Bush today embarked on the first full state visit by an American President to Britain, which is also the most controversial, with his exposure to the public kept to minimum due to security concerns. Jean Chretien has announced that he will end his 10-year run as Prime Minister on December. 12, giving way to successor Paul Martin. Chretien, who turns 70 in January, previously said he would retire as Prime Minister by February 2004 under pressure from Martin, his Liberal Party and opposition groups, he now will step aside after attending a Commonwealth summit in Nigeria in early December. The police and prosecutors yesterday swooped on pop icon Michael Jackson’s Neverland Ranch in California, officers said, amid media reports that a 12-year-old boy had accused the star of abuse. The two Britons who broke the idol of Lord Rama at the Ealing Road Sanatam Mandir in Wembley last month, were sentenced for “racially aggravated criminal damages”. 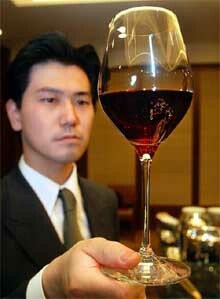 A waiter looks at this year's version of Beaujolais Nouveau wine, a few hours before its release for sale at a hotel in Tokyo on Wednesday. Beaujolais Nouveau, made from grapes harvested in France's Beaujolais region, goes on sale just after the clock strikes midnight on the third Thursday of November. Miss World contestants (from left to right), Miss Paraguay Karina Naumann, Miss Russia Svetlana Goreva, Miss Miri Levy and Miss Malta Rachel Xuereb pose during a photo call near the Great Wall of China in Beijing on Wednesday. The suspension expired today and the Parliament immediately reconvened with Speaker Joseph Michael Perera saying President Kumaratunga had no authority to prorogue Parliament without the concurrence of the legislature, which is controlled by a party that is opposed to her. "Preventing the functioning of Parliament can thus be construed as a breach of its collective rights and it is my hope that the prorogation does not set an unhealthy precedent for the future," the Speaker said. He said if confronted with such "abuse of power" by the President, the majority of members should have the right to ask for Parliament to reconvene. He also recommended the amending of standing orders of Parliament to carry out the function "beyond controversy". Speaker Perera is from Prime Minister Ranil Wickremesinghe's United National Party, but his office is neutral in the Assembly and his rulings are binding on the legislature and cannot be challenged in court. The Speaker, citing Parliamentary experience in Britain, Australia, India and New Zealand, said no Parliament in the world had been suspended by an executive without the concurrence of the Prime Minister. He argued that the President as one branch of the state cannot be seen to suppress another branch that is exercising the sovereignty of the people. President Bush, his wife Laura and a 700-strong entourage were greeted upon arrival at the Heathrow airport yesterday by Prince Charles, then whisked to the Buckingham Palace by US Military helicopter Marine One for the heavily guarded gardens of the palace. In the palace, Queen Elizabeth II received them amidst royal pagentry complete with brass band and a 41-gun salute. Shortly before Air Force One touched down at the airport, it was announced that a visit this afternoon to the memorial in Grosvenor Square Mayfair near U S Embassy to the victims of the September 11 had been called off. The Foreign Office said the President’s schedule had always been fluid, but fears over his security are believed to have played a part in the decision that he should meet families of the British victims inside the embassy and not go outside to pay respects at the memorial as planned. Jean Chretien has announced that he will end his 10-year run as Prime Minister on December. 12, giving way to successor Paul Martin. Chretien, who turns 70 in January, previously said he would retire as Prime Minister by February 2004 under pressure from Martin, his Liberal Party and opposition groups, he now will step aside after attending a Commonwealth summit in Nigeria in early December. Martin was chosen the new Liberal Party leader last week, and automatically become Prime Minister when Chretien leaves office. They met for 45 minutes yesterday to work out a transition schedule, then held a brief news conference where Chretien announced the December 12 departure date. At 8.30 am Santa Barbara sheriff’s department and district attorney’s office investigators executed a search warrant at the Neverland Ranch in connection with a criminal matter,” Commander Jeff Meyer said. “As of now, there is no further information regarding the cause or the circumstances regarding the service of the search warrant, which was approved by a judge,” he said. Jackson’s lawyers said they had no idea of the reason for the high-profile search of the “king of pop’s” palace, while his publicist said the superstar was out of town when the raid began. But the Court TV and several other US media outlets reported that the dramatic police swoop was in connection with an abuse charge from a 12-year-old boy. The raid on the reclusive superstar’s country mansion comes nine months after prosecutors investigated his admission in an interview that he slept in the same bed as a 12-year-old boy before dismissing claims of wrongdoing. But Court TV said the latest swoop was not connected to the earlier investigation. Prosecutors in Santa Barbara, a town about 160 km north of Los Angeles near which the eternally-youthful Jackson (45) has lived for years, declined to comment on the raid. The Brent Magistrate Court on November 17 sentenced Toby Champney to two months imprisonment for “racially aggravated criminal damages”. His fellow Christian preacher, Benjamin Lloyd Jones was fined 400 pounds for racially aggravated threatening behaviour, and set free. The lower court’s sentence has angered the Hindu community and many of them have raised the question of why a higher court had not heard the case. “We do not know why a higher court did not hear the case. A Magistrate’s Court can only award a maximum sentence of six months for racially aggravated criminal damage, whereas a Crown Court has the discretion to award sentences as long as 14 years,” said Mr Venilal Vaghela, who chairs the Hindu Council of Brent. “The fine is not deemed a sufficient deterrent for preventing such behaviour in the future. The maximum fines allowed for racially aggravated disorderly behaviour is 2,500 pounds,” he said.